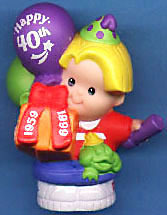 In 1997 Fisher-Price discontinued the 1991-1996 Chunky Little People line of toys and introduced a new style of Little People. These new style figures are very detailed, squeezable plastic figures with arms. Most of the "new" sets that were introduced in 1997 were basically the same in theme and appearance as the Chunky Little People sets, such as the House, Barn, Garage, Circus Train, and School Bus. Click here for a list of all known Current Little People sets made up until 1999 in order by model number. The biggest change that Fisher-Price made with the Current Little People is that they now offer Limited Edition collectable sets. These Limited Edition sets are typically holiday related items, such as a small Christmas sets with a Santa Claus figure, or Easter sets with rabbits and lambs. Apparently this Limited Edition approach is working well for the company, as each year they seem to make more and more Limited Edition sets. In 1997, they offered one Limited Edition Christmas set, yet in 1999, there are an incredible 7 different Limited Edition Christmas sets, as well as the first Limited Edition Halloween set! These sets are fun, imaginative, and relatively inexpensive. But if you want to collect them all, you'd better get started, because once they leave the stores, it's very difficult to find the sets that you missed!